The author Frederick Schiller Faust, writing as Max Brand, created the character of "Dr. James Kildare" as a fictionalized version of his college friend, Dr. George Winthrop "Dixie" Fish, a New York surgeon. He first introduced the character in a pulp fiction short story, "Internes Can't Take Money," that appeared in the March 1936 issue of Cosmopolitan magazine. A second Kildare story, "Whiskey Sour," was published in Cosmopolitan in April 1938. In these early stories, Dr. James "Jimmy" Kildare is an aspiring surgeon who leaves his parents' farm to practice at a fictional big city hospital, and through his work, comes into contact with underworld criminals. The first Kildare film, Internes Can't Take Money (1937), based on the short story of the same title and made by Paramount, followed this version of the character. In 1938, Metro-Goldwyn-Mayer (MGM) contracted with Faust to acquire the rights to the Kildare character along with Faust's services as a film story writer. Faust then made major changes to the character to fit MGM's idea for a new movie series, including changing Kildare's specialty to diagnostics rather than surgery, introducing the character of Kildare's superior "Dr. Leonard Gillespie," de-emphasizing the criminal elements, and restarting the story from Kildare's first arrival at the city hospital. Faust (as Max Brand) collaborated with MGM on its Kildare film series starting with the first MGM series release, Young Dr. Kildare (1938) and continuing through The People vs. Dr. Kildare (1941). During this time, Faust wrote several original Kildare stories which were first published in magazines, later republished in novel form, and made into films by MGM. The stories were written prior to the films being made, and were not published as movie tie-ins. After The People vs. Dr. Kildare, Faust and MGM parted ways. Faust was not involved in Dr. Kildare's Wedding Day, Dr. Kildare's Victory, or any of the subsequent films featuring Dr. Gillespie, although Faust (as Max Brand) continued to receive a credit for creating the characters. Faust's last two Kildare stories, "Dr. Kildare's Hardest Case" (published in 1942) and the unfinished story "Dr. Kildare's Dilemma" (posthumously published in the early 1970s), were not made into films. In 1944, Faust was killed in Italy while working as a war correspondent. The following table lists the Max Brand-authored Kildare stories in chronological order of first publication. Due to the continuing popularity of the characters in film, radio and television series, many reprints, different formats, and different versions of the original Kildare books have since been released. "Internes Can't Take Money" Cosmopolitan, Mar. 1936 Included in The Collected Stories of Max Brand (ed. Robert and Jane Easton), Univ. of Nebraska Press, 1994, p. 218-235. Internes Can't Take Money (1937) First appearance of Dr. Kildare character; basis for first Kildare film, made by Paramount. Dec. 17, 1938 (part 1); Dec. 24, 1938 (part 2); Dec. 31, 1938 (part 3) Young Dr. Kildare, Dodd, Mead (1940) Young Dr. Kildare (1938) Basis for first film in Kildare series made by MGM; first appearance of Dr. Gillespie character. Mar. 25, 1939 (part 1); Apr. 1, 1939 (part 2); Apr. 8, 1939 (part 3) Calling Dr. Kildare, Dodd, Mead (1940) Calling Dr. Kildare (1939) Basis for second film in MGM series. (condensed version) The Secret of Dr. Kildare, Dodd, Mead (1940) The Secret of Dr. Kildare (1939) Basis for third film in MGM series. (compilation of "Dr. Kildare's Girl" and "Dr. Kildare's Hardest Case") Dr. Kildare's Strange Case (1940) Basis for fourth film in MGM series. (alternate title: Dr. Kildare Takes Charge) Dr. Kildare Goes Home (1940) Basis for fifth film in MGM series. "Dr. Kildare's Crisis" Serialized in four parts in Argosy : Dec. 21, 1940 (part 1); Dec. 28, 1940 (part 2); Jan. 4, 1940 (part 3); Jan. 11, 1941 (part 4) Dr. Kildare's Crisis, Dodd, Mead (1942) Dr. Kildare's Crisis (1940) Basis for sixth film in MGM series. (condensed version) Dr. Kildare's Trial, Dodd, Mead (1942) The People vs. Dr. Kildare (1941) Basis for seventh film in MGM series; last collaboration between Faust and MGM. Feb. 1971 (part 1); Jan. 1973 (part 2) A restored fragment was included in The Max Brand Companion (ed. Jon Tuska et al. ), Greenwood Press, 1996, p. 318-335. None Faust's last Kildare story, never finished; posthumously published in the 1970s in unfinished form. Aside from the Kildare stories, Faust (as Max Brand) wrote only one other medical story, "My People," which appeared in the August 1940 issue of Cosmopolitan. "My People" featured a character, "Dr. Maynard," who was similar to Dr. Kildare. MGM acquired the rights to "My People" as a possible concept for a Kildare film, but it was never developed. The popularity of the 1960s Dr. Kildare TV series and its star, Richard Chamberlain, resulted in a number of contemporary tie-in novels by several different authors. Several were released in mass-market paperback form by Lancer Books, while titles aimed at preteen and young teen readers were published by Whitman. The covers featured photographs of Chamberlain as Kildare, or artwork using his likeness. Known titles are listed below. The character of "Dr. Kildare" first appeared on film in the 1937 Paramount film, Internes Can't Take Money, based on Max Brand's previously published short story of the same name and starring Joel McCrea as Dr. Kildare. The plot focused on Dr. Kildare's attempt to help a young female ex-convict (played by Barbara Stanwyck) locate her child. Paramount did not plan any further Kildare films, probably because box office returns did not meet expectations. Lionel Barrymore as "Dr. Gillespie" and Lew Ayres as "Dr. Kildare" in Young Dr. Kildare (1938), the first of nine MGM "Dr. Kildare" series films in which the duo appeared. MGM had noted the popularity of the Kildare character in pulp magazines and, following the release of Internes Can't Take Money, saw an opportunity to obtain an undervalued property and develop a successful film series. In 1938, MGM entered into a deal with author Frederick Schiller Faust (as Max Brand) to acquire the rights to "Dr. Kildare" and have Faust work with MGM on developing stories for a film series. Seven "Dr. Kildare" films were subsequently made by MGM based on stories originally written by Faust. After The People vs. Dr. Kildare (1941), Faust and MGM ended their collaboration and MGM continued the series using stories by other writers, though Faust (as Max Brand) still received a credit for creating the characters. 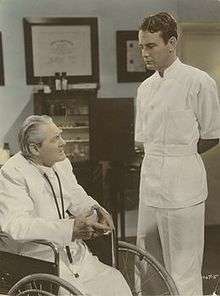 In the MGM series, the "Dr. Kildare" character (played by Lew Ayres) first appears as a medical intern newly arrived at a New York City hospital, where he attracts the attention of a respected older physician and skilled diagnostician, Dr. Leonard Gillespie (played by Lionel Barrymore). After becoming a doctor, Kildare faces a number of professional and personal challenges in the course of his work, while being mentored by Gillespie. In 1942, during the making of the tenth film in the MGM series, originally titled Born to Be Bad, Ayres was drafted to serve in WWII and declared himself a conscientious objector. The resulting negative publicity caused MGM to cut Ayres from the film, eliminate the character of Kildare, and change the film's focus to Barrymore's character Gillespie, eventually releasing the revamped film as Calling Dr. Gillespie (1942). The character of a young doctor mentored by the experienced Dr. Gillespie was played by Philip Dorn (as "Dr. John Hunter Gerniede"). MGM made several more films featuring the Dr. Gillespie character mentoring various young doctors played by Van Johnson (as "Dr. Randall 'Red' Adams"), Keye Luke (as "Dr. Lee Wong How"), and James Craig (as "Dr. Tommy Coalt"). Warners also released the complete set of Dr. Gillespie films on DVD as the "Dr. Gillespie Movie Collection" via Warner Archive Collection in November 2014. The Kildare character first appeared on radio on October 13, 1938, when Lionel Barrymore and Lew Ayres performed a scene from their soon-to-be-released film, Young Dr. Kildare, on MGM's "Good News of 1939" radio program. In the summer of 1949, MGM reunited Lew Ayres and Lionel Barrymore to record the radio series, The Story of Dr. Kildare, which used the concept and characters of the earlier Young Dr. Kildare story and did not include any of the young doctors who had replaced Kildare in the later films featuring Dr. Gillespie. By this time, Ayres had returned to public favor after serving in WWII as a medical corpsman. Episodes were scripted by James Moser, Jean Holloway, Les Crutchfield, E. Jack Newman, John Michael Hayes, Joel Murcott, and others. The supporting cast included Ted Osborne as hospital administrator Dr. Carew, Eleanor Audley as receptionist Molly Byrd, Jane Webb as nurse Mary Lamont, and Virginia Gregg as nurse Evangeline Parker, labeled "Nosy Parker" by Gillespie. In addition, many prominent West Coast radio actors made recurring appearances, including Raymond Burr, William Conrad, Stacy Harris, Lurene Tuttle, Barton Yarborough, and Jack Webb. In 1953, Lew Ayres was approached to play "Dr. Kildare" in a television series, which would feature Dr. Kildare having finally taken over the practice of a retired Dr. Gillespie. After two pilots were filmed, Ayres refused to work further on the project unless the television studio refused to allow cigarette companies to sponsor the program. Ayres later explained, "My feeling was that a medical show, particularly one that might appeal to children, should not be used to sell cigarettes." The studio would not agree to reject lucrative advertising, so the project was abandoned. Raymond Massey as "Dr. Gillespie" and Richard Chamberlain as "Dr. Kildare," in the 1961 Dr. Kildare television series. A second attempt at a television series was made in the early 1960s with Dr. Kildare, a NBC medical drama television series starring Richard Chamberlain in the title role, produced by MGM Television and inspired by the original Dr. Kildare stories and films. Lew Ayres appeared as "Dr. Gillespie" in a 1960 unsold and unaired pilot (with Joseph Cronin as Kildare), but Raymond Massey was cast as Gillespie in the version that finally went to air. Premiering on September 28, 1961, the series was a top-10 hit with audiences and ran until April 5, 1966, for a total of 191 episodes in five seasons. The first two seasons told the story of Dr. James Kildare (Chamberlain), working in a fictional large metropolitan hospital while trying to learn his profession, deal with his patients' problems and earn the respect of the senior Dr. Leonard Gillespie (Massey). In the third season, Dr. Kildare was promoted to resident and the series began to focus more on the stories of the patients and their families. The success of the show (along with ABC's contemporaneous medical drama Ben Casey) inspired the launch of numerous other television medical dramas in the ensuing years. In 1972 MGM Television created a short-lived syndicated drama series called Young Dr. Kildare, starring Mark Jenkins as Dr. James Kildare and Gary Merrill as Dr. Leonard Gillespie. The series was not a success, and only 24 episodes were produced. From 1962 to 1965, Dell Comics published a Dr. Kildare comic book based on the 1960s Dr. Kildare television series. The first issue was released April 2, 1962, as No. 1337 in Dell's Four Color Comics line, and featured a story involving a gambler checking into Dr. Kildare's hospital to hide from a hit man. Dell subsequently continued the comic book for a total of nine issues, with the final issue appearing in April 1965. All issues had photo covers featuring Richard Chamberlain, the star of the TV series. A Dr. Kildare daily comic strip based on the 1960s television series and drawn by Ken Bald also premiered on October 15, 1962. Bald was required to base his drawing of Dr. Kildare on photos of Richard Chamberlain, but made up his own drawings of other characters, including Dr. Gillespie. The daily strip, drawn by Bald, ran for over two decades until April 21, 1984, outlasting the television series (which was cancelled in 1966) by nearly 18 years. A Sunday strip also ran from April 19, 1964 to April 3, 1983. Bald retired after the cancellation of the daily strip. Decter, Midge. "Who Killed Dr. Kildare?" in Culture in Crisis and the Renewal of Civil Life (ed. T. William Boxx and Gary M. Quinlivan). Rowman & Littlefield, 1996, p. 49-56. ISBN 0847682889. Marchessault, Janine. "Men in White, Women in Aprons: Utopian Iconographies of TV Doctors," in Figuring It Out: Science, Gender, and Visual Culture (ed. Ann B. Shteir & Bernard Lightman). Univ. Press of New England, 2006, p. 315-335. ISBN 978-1-58465-602-9. Doctor (novel series), A British dramatic comedy series of novels, films, and serialized television programs. 1 2 3 4 5 6 Mavis, Paul. "Dr. Kildare Movie Collection (Warner Archive Collection)" (DVD review). DVDtalk.com, Mar. 16, 2014, accessed Mar. 29, 2015. ↑ Movies News Desk (21 January 2014). "Dr. Kildare Among Warner Archive's New Releases". Broadway World. Wisdom Digital Media. Retrieved 8 June 2014. 1 2 3 4 5 6 7 8 The Digital Deli Online, "The Story of Dr. Kildare (Radio Program)." digitaldeliftp.com, accessed Mar. 29, 2015. ↑ Mcneil, Alex. Total Television: The Comprehensive Guide to Programming from 1948 to the Present - Revised Edition. Penguin Books, 1996, p. 225. ISBN 978-0140249163. 1 2 Polite Dissent (blog), "The Brief 'Golden Age of Medical Comics'," politedissent.com, May 28, 2012, accessed Mar. 29, 2015. 1 2 3 4 The Archivist, "Ask the Archivist: Calling Dr. Kildare." The Comics Kingdom Blog, comicskingdom.com, Oct. 24, 2012, accessed Mar. 29, 2015. ↑ "Young Dr. Kildare" overview, TVguide.com, accessed Mar. 29, 2015. ↑ Marchessault, Janine. "Men in White, Women in Aprons: Utopian Iconographies of TV Doctors," in Figuring It Out: Science, Gender, and Visual Culture (ed. Ann B. Shteir & Bernard Lightman). Univ. Press of New England, 2006, p. 315-335. ISBN 978-1-58465-602-9. 1 2 Richardson, Darrell Coleman, ed. Max Brand, the Man & His Work: Critical Appreciations and Bibliography. Fantasy Pub. Co., 1952, p. 98. ↑ Easton, Robert and Jane, ed. "Internes Can't Take Money" (introduction to reprint of story written by Max Brand), in The Collected Stories of Max Brand (hereinafter, Collected Stories). Univ. of Nebraska Press, 1994, p. 217. ISBN 0-8032-1244-5. 1 2 Copyright Office - Library of Congress. Catalog of Copyright Entries: Third Series - Books and Pamphlets Including Serials and Contributions to Periodicals, Current and Renewal Registrations. Jan.-Jun. 1966, p. 1143. 1 2 Brand, Max. "Internes Can't Take Money," in Collected Stories, p. 218-235. 1 2 3 4 Herzog, Evelyn. "Young Detective Kildare." The Mystery Fancier (ed. Guy M. Townsend), Mar.-Apr. 1983, p. 1, 9. 1 2 Zodin, Susan L. "The Making of a Medical Man: Max Brand's Young Dr. Kildare," in The Max Brand Companion (ed. Jon Tuska et al. ), Greenwood Press, 1996, p. 463. ISBN 0-313-29750-9. 1 2 3 4 5 6 7 8 9 Herzog, p. 9. 1 2 Zodin, p. 463-474. 1 2 Zodin, p. 475-477. ↑ Associated Press, "Max Brand, Author of 'Dr. Kildare' Killed in Italy." Lock Haven (Pennsylvania) Express, May 16, 1944, p. 1. 1 2 3 Unless otherwise specified, all publication data in the table is sourced from the official Max Brand website at MaxBrandOnline.com. See Bibliography of Max Brand works, MaxBrandOnline.com, accessed Mar. 28, 2015. 1 2 3 Zodin, p. 463-477. 1 2 Nolan, William F., ed. Max Brand, Western Giant: The Life and Times of Frederick Schiller Faust. Popular Press, 1985, p. 151. ISBN 0-87972-291-6. ↑ Although the official Max Brand bibliography available at MaxBrandOnline.com lists the title of this book as Dr. Kildare Goes Home, several other sources (cited following this reference) list the book title as Dr. Kildare Takes Charge. 1 2 Drew, Bernard A. Literary Afterlife: The Posthumous Continuations of 325 Authors' Fictional Characters. McFarland & Co., 2010, p. 72-73. ISBN 978-0-7864-4179-2. 1 2 Tuska, Jon, et al., ed. The Max Brand Companion (list of publications). Greenwood Press, 1996, p. 176. ISBN 0-313-29750-9. 1 2 Zodin, p. 476-477. ↑ Brand, Max. "Dr. Kildare's Dilemma: A Fragment" in The Max Brand Companion (ed. Jon Tuska et al.). Greenwood Press, 1996, p. 318-335. ↑ Copyright Office - Library of Congress. Catalog of Copyright Entries: Third Series - Books and Pamphlets Including Serials and Contributions to Periodicals, Current and Renewal Registrations. Jul.-Dec. 1967, p. 2603. ↑ Berch, Victor A., Letter to Editor (regarding Lancer-published titles authored by Norman A. Daniels). Paperback Quarterly, Spring 1982, p. 49. ↑ Tony's Trading, "Dr. Kildare" Gallery, tonystrading.co.uk, accessed Apr. 20, 2015. ↑ "Ayres Backs His Project Religiously : Film: Actor best known for 'Dr. Kildare' says his documentary, 'Altars of the World,' represents the bigger part of his life today.". Los Angeles Times. Retrieved 16 February 2015. ↑ "Lionel Barrymore Has Title Role in 'Calling Dr. Gillespie,' of the Dr. Kildare Series, at Loew's Criterion Theatre." The New York Times, Jul. 9, 1942, Section Amusements p. 17. 1 2 Zodin, p. 477. ↑ Coffin, Lesley L. Lew Ayres: Hollywood's Conscientious Objector. Univ. Press of Mississippi, 2012, p. 99-121. ↑ "Dr. Kildare's Strange Case" DVD listing, Amazon.com, accessed Apr. 24, 2015. ↑ "The Secret of Dr. Kildare" DVD listing, Amazon.com, accessed Apr. 24, 2015. ↑ "Dr. Kildare's Strange Case - Digitally Remastered" DVD listing, Amazon.com, accessed Apr. 24, 2015. ↑ Mavis, Paul. "Dr. Gillespie Film Collection (Warner Archive Collection)" (DVD review). DVDtalk.com, uploaded Dec. 19, 2014, accessed Apr. 24, 2015. ↑ Mavis, Paul. "The Barbara Stanwyck Collection (There's Always Tomorrow, All I Desire, The Lady Gambles, Internes Can't Take Money, and more)" (DVD review). DVDtalk.com, uploaded Apr. 27, 2010, accessed Apr. 24, 2015. ↑ http://www.otrsite.com/logs/logg1019.htm, Jerry Haendiges Vintage Radio Logs, Series "Good News of 1939," entry 90236 for "Young Dr. Kildare." otrsite.com, accessed Apr. 2, 2015. 1 2 3 Coffin, p. 151. ↑ Dunning, John. On the Air: The Encyclopedia of Old-Time Radio. Oxford Univ. Press, 1998, p. 205-206. ISBN 978-0-19-507678-3. 1 2 Old Time Radio Researchers Group, "Dr. Kildare - Single Episodes" (archive of 60 individual episodes), archived at https://archive.org/details/OTRR_Dr_Kildare_Singles, accessed Apr. 10, 2015. ↑ http://www.otrsite.com/logs/logd1023.htm, Jerry Haendiges Vintage Radio Logs, Series "The Story of Dr. Kildare." otrsite.com, accessed Apr. 11, 2015. It appears possible based on this source and The Digital Deli Online that more than 60 episodes were made and that the total number of episodes could be 78 (according to The Digital Deli Online), 80 (according to Haendiges) or even 104 (according to The Digital Deli Online). ↑ Metro-Goldwyn-Mayer Radio Attractions, "Jet Propelled...And Heading Your Way!" (MGM advertisement for 8-program radio package). Billboard, Nov. 5, 1949, p. 13. ↑ "MGM Program Lineup Finalized by Mutual." Billboard, Nov. 17, 1951, p. 5. ↑ Terrace, Vincent. Encyclopedia of Television Pilots, 1937-2012. McFarland & Co., 2013, p. 77. ISBN 978-0-7864-7445-5. ↑ News Brief (mentioning test film for new "Dr. Kildare" TV series starring Lew Ayres and Joseph Cronin), TV Guide, Feb. 20, 1960. ↑ "Dr. Kildare - NBC (ended 1966)" (overview), TV.com, accessed Mar. 28, 2015. ↑ Philips, Deborah. "Medicated Soap: The Woman Doctor in Television Medical Drama," in Frames and Fictions on Television: The Politics of Identity Within Drama (ed. Bruce Carson & Margaret Llewellyn-Jones). Intellect Books, 2000, p. 52. ISBN 1-84150-009-7. ↑ Brooks, Tim, and Earl Marsh. The Complete Directory to Prime Time Network and Cable TV Shows, 1946-Present (Ninth Edition). Ballantine Books, 2007, p. 371. ISBN 978-0-345-49773-4. ↑ Berkowitz, Edward D. Mass Appeal: The Formative Age of the Movies, Radio and TV. Cambridge Univ. Press, 2010, p. 128-129. ISBN 978-0-521-88908-7. ↑ "Young Dr. Kildare" TV Series entry at Internet Movie Database, imdb.com, accessed Mar. 28, 2015. ↑ Erickson, Hal. Syndicated Television: The First Forty Years, 1947-1987. McFarland & Co., 2001, p. 221-222. ISBN 978-0786411986. ↑ Thompson, Maggie, Complete List of Four Color Comics Issues, atomicavenue.com, accessed Apr. 14, 2015. 1 2 3 "Four Color Comics 1337 (Dell, 1962)," politedissent.com, uploaded Aug. 3, 2005, accessed Apr. 14, 2015. 1 2 "Four Color #1337" (archive of issue), comicbookplus.com, uploaded Nov. 4, 2013, accessed Apr. 14, 2015. ↑ "Dr. Kildare" (archive of issues), comicbookplus.com, uploaded Jun. 20, 2013, accessed Apr. 14, 2015. ↑ "Dr. Kildare (1962) Comic Books" (list of issues), mycomicshop.com, accessed Apr. 14, 2015. ↑ Wells, John, et al. American Comic Book Chronicles: 1960-1964. TwoMorrows Publishing, 2012, p. 77. ISBN 978-1-60549-045-8. 1 2 "Dr. Kildare in Daily Comic Strip," Daytona Beach Morning Journal, Oct. 11, 1962, p. 9. ↑ Syracuse University Library, "Ken Bald Papers - Biographical History" (online description), library.syr.edu, accessed Apr. 16, 2015.